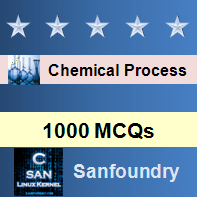 This set of Chemical Process Calculation Multiple Choice Questions & Answers (MCQs) focuses on “Density and specific gravity-I”. Explanation: Mass per unit volume is called density. 2. Densities for ________ and ________do not change significantly at ordinary conditions with pressure. Explanation: Densities for liquids and solids do not change significantly at ordinary conditions with pressure. Explanation: Specific volume is the inverse of density. 4. Specific gravity is the ratio of density of a substance to the density of a reference material. Explanation: Specific gravity is the ratio of density of a substance to the density of a reference material.. Explanation: density of water = 1 gm/cm3 = 1000 Kg/m3 = 62.43 lb/ft3. Explanation: Simple rule for the representation. 7-8. Specific gravity of a liquid is 2.39. 7. What is the density of the liquid in g/cm3? Explanation: Specific gravity is the ratio of the density of a substance to the density of a reference material. 8. What is the density of the liquid in kg/m3? 9. Specific gravity of a substance is 2.42. What is the density of the substance in lb/ft3? 10. Mass that a cube contains is 40 gm and having side length of 1 cm. What is the density of the material inside the cube?